Do you want to have a relaxing holiday trip with your children? No problem with SpatzenTourist. You'll find everything you need at your holiday resort here; ready to be rented by you and easily ordered online. Strollers, bicycle trailers & Co. start from less than 10 EUR per day. 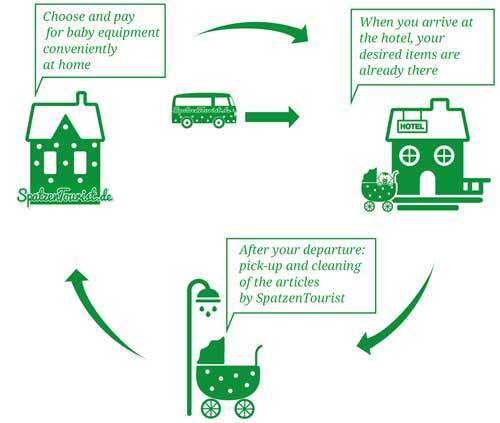 You have arrived in Germany and forgot important baby items like a baby carrier or a high chair? SpatzenTourist can help you out and will provide you with everything you need at your Hotel - On your request even as express delivery! That is the goal of SpatzenTourist. We are a young company from Dresden and make it possible for you and your family to explore German towns or villages by travelling with light luggage. We provide everything your family needs on a vacation in Germany: From a child's car seat to a buggy up to a baby's high chair. No more worries about packing your car before a holiday trip since everything you need is already here! Thus, you have enough space for your suitcases in your car. Furthermore, you have the possibility to try out the newest models of children equipment. You chose your children’s equipment comfortable from home and pay online. Then, the only thing you have to do is to look forward to your holiday trip as your order will be delivered at the exact time to your hotel or even to the airport or a train station in Dresden. Essential consumable products like nappies or infant food can be delivered to your accommodation as well. If you're looking for a long-term rent, because you’re temporarily working in Germany or you don’t want to fill up your apartment or basement with a lot of baby items that are needed only for a certain period of time - then we are happy to provide you with a special quote. Whether you're looking for a rental of our products, have questions about SpatzenTourist or just didn't find what you were looking for - please contact us - we are happy to help! Pick your items, rental period and delivery address in the shop. Please note that the shop is currently only available in German. While you arrive relaxed in Germany your ordered items are already here. At your departure the rented items will be picked up free* of charge. * In the urban area of Dresden. All other areas in Germany and costs are listed in the table delivery costs. Whether you’re staying in Berlin, Munich, Frankfurt, Düsseldorf, Hamburg, at the Baltic Sea or North Sea – we deliver nationwide in Germany. For a short break in the big city? We deliver cots, high chairs and buggy directly to your hotel. Dresden has something to offer for everyone: Art and Culture in numerous museums, the Zwinger or the Frauenkirche, the Semper Opera House or music at the Dresden Music Festival. But you can also just relax with a boat trip on Elbe River while enjoying the marvelous vineyards. It worked great! The stroller was in perfect shape, very clean and fully functional. Actually like new. Our son Friedrich felt immediately comfortable. Delivery and pick up has worked without any problems. ... Your service has made it much easier for us to pack our car." Dresden is one of the greenest cities in all of Europe, with 63% of the city being green areas and forests. The nearby Saxon Switzerland also has to offer fairy-tale landscapes. How old or used are your rental products? SpatzenTourist offers only new or as good as new items. After a hire all items are cleaned properly and only products with slight traces like as small scratch are offered by us again. Where do the rental items come from? We purchase our rental products directly from the manufacturer. Second-hand products will not be rented. What do I do if something breaks or gets dirty? Normal traces of wear as dirty wheels or crumbs on child safety seats are an everyday occurrence with children and you don’t need to worry about it. Only when there are obviously traces of improper use then we will charge the customer for it. What do I do if something gets stolen? We recommend to our customers not to leave strollers or other items unattended nor unsecured. However, when something should get stolen then you have to report this theft to the police and we will settle the rest with our insurance. Is the deposit collected per order or per item? There will be only one deposit in the whole cart, when this cart contains rental items. For more information on the deposit, please refer to the page Payment and Delivery Terms. Is it possible to book multiple rentals with different start and end dates at once? Yes, this is possible. Please also note, that extra charges may apply for the additional deliveries. Should a rental product not be available for a desired period just contact us and we’ll try to make your booking happen. Is it possible to deliver items to places like the airport? No matter how you travel to Germany: We are doing our best to find a way to get stroller and co. to your place at the desired time. Therefore, we also deliver to destinations that are not holiday or private accommodations (e.g. an airport). Please note that in this case extra charges may apply. Train stations within the city of Dresden. Is it possible to have a delivery or pick-up outside the opening hours? In general we deliver and pickup rental products between 9.00 and 21.00 hrs. However, a delivery and pickup at other times, for example because you arrive late at night or leave early, is possible but you have to book it with your order. Is renting over a long period more or less expensive? In general the rent is cheaper when you’re renting for a longer period. How does SpatzenTourist clean its returned items? The returned items are cleaned in accordance with the type of dirt and use. Therefore, we try to use only eco-friendly and eudermic cleansing material. Since the disinfection of rental objects are not in the interest of all users, we perform disinfections only on costumers request – Please send us an e-mail for this purpose! What does SpatzenTourist do with my personal data? Personal data will be used only for the payment transactions, bill preparation and delivery. A transfer of data to other parties does not occur. More information can be found in the Privacy statement. Is it possible to pick up or return the rented items personally? Currently we do not provide this service. However, if you contact us with your pick-up / return request, then we’ll try to make this possible in exceptional cases. What brands can I rent from SpatzenTourist? We’re happy to supply you with products from Quinny, Maxi-Cosi, Hartan, Manduca, Thule, Didytai, Phil and Teds, Römer, Medela and Puky. We respond fastest to emails and form enquiries.